I've spent the last 3 days delving into the depths of the Android SDK and you know what? they've been a pretty plesant 3 days. The API documentation takes a little getting used to but when you figure out the best way to navigate it is to use search (I should've figured that one out a little quicker for a google product) it all starts to fall into place pretty quickly. The Android guys have provided a pretty complete set of default widgets and themes to make development rapid and to make your final product blend well into the phones UI. 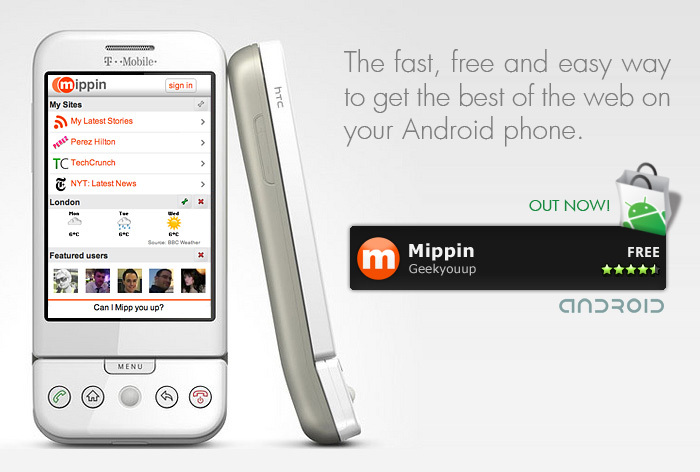 The result of my time spent on the Android SDK is the Mippin app, which is now in the Android Market Store. That's right I finished the first version of the app yesterday evening and within 10 minutes I'd signed up, paid my $25 to become a registered Android developer and published the app into the Market place, seconds later it was live for download. That was a great experience, so simple, I spent the evening checking my phone every half hour to see how many downloads the app had and to see the comments coming in. In the first 12 hours there were over 3000 downloads - not bad. This sends the result to the onActivityResult() method in the calling Activity. In the onCreate() method of an Activity just call setRequestedOrientation(ActivityInfo.SCREEN_ORIENTATION_SENSOR); this works for all standard widgets that support orientation like the WebView. I'm liking Mippin on the G1. Very easy to get a lot out of it!